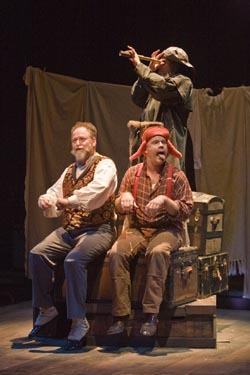 Dierk Torsek, Mike Ryan, and Karen Aldridge in Shakespeare Santa Cruz's new production of "Shipwrecked! The Amazing Adventures of Louis de Rougemont (As Told By Himself). Photo: r.r. jones. Shakespeare Santa Cruz (SSC) will explore the always relevant and highly entertaining themes of power, politics, and trust, plus the time-honored traditions of storytelling in its 28th season, beginning July 24. SSC's 2009 summer festival presents two contrasting plays by William Shakespeare amidst the intimate redwoods of the outdoor Sinsheimer-Stanley Glen--the ethereal, magical comedy A Midsummer Night's Dream, and the edgy political tragedy Julius Caesar. The indoor Theatre Arts Mainstage will additionally showcase the Bay Area premiere of the exuberant, family-friendly adventure, Shipwrecked! An Entertainment-the Amazing Adventures of Louis De Rougemont (As Told By Himself), by Pulitzer Prize-winning playwright Donald Margulies. All three plays will be performed in repertory through August 30. A Midsummer Night's Dream director Richard E.T. White's most recent professional Shakespeare production was performed in Japanese; he co-directed As You Like It with his wife for Theatre Company Subaru in Tokyo. White noted that for A Midsummer Night's Dream, SSC audiences can expect an evening of laughter, suspense, playfulness, and abundant music. "Everything is fresh about this play because it is so well-structured, yet so playful within its formality," said White in a recent interview with UCSC professor emertus Don Rothman. "The presence of magic, which is hugely subjective, allows multiple and wide interpretations.it's a jungle gym of wonders," White added. Well-known for its direct and powerful language, Julius Caesar is a riveting political drama, set in a time of intense political wrangling. Lines blur between the fight for the public good and the fight for personal interest. "The parallels between the political dynamics of ancient Rome dramatized in Shakespeare's play and the recent challenges to our society's social and political welfare are stunningly obvious," director John Sipes has noted. "Democracy is always at risk if too much power is consolidated in one man. The Roman senators in Julius Caesar knew that, and in our day, we have learned a similar lesson." Embracing theatricality in its purest form, Shipwrecked can only be described as a fantastical romp of good old-fashioned storytelling-exciting enough for young people, while offering a searing and poignant tale for adults. "Shipwrecked! is many things to many people--on the one hand, an epic adventure story in the grand tradition of Robinson Crusoe and Treasure Island, and on the other hand, a profound examination of our culture's need to believe the unbelievable," said director Eric Ting. "Most audiences will fall in love with the play somewhere between the two," he added. For ticket information, go to: shakespearesantacruz.org or call (831) 459-2159. $13 Youth Tickets (under 18) available for any performance, any seat, any venue. Unsold tickets for any Glen performance are available for purchase (in person only) one hour prior to every show: $20. Shipwrecked! Buy one, get one: Purchase any full-price ticket for Shipwrecked! (7/21-8/9 only) and get EITHER a second ticket to the same performance free OR a free Groundling ticket on weekday performances for either A Midsummer Night's Dream or Julius Caesar through 8/16/09. Must purchase by phone or in person at the UCSC Ticket Office. (831) 459-2159. Every performance of Shipwrecked! has advance tickets available for $15 in the Value (side) sections.